"They were alone on this Pacific Island... trapped behind enemy lines... the marine who had been thru Hell and Sister Angela with her supreme faith in God." 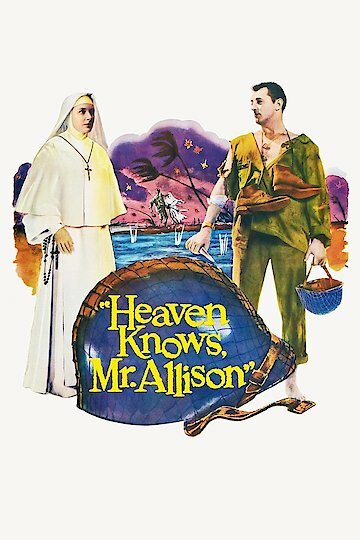 Stranded on an island, a marine and a nun work together to survive. Their is an abandoned village where they take shelter, but their situation grows more dire when a troop of Japanese soldiers set up a base nearby. Forced to flee into the wilderness, the two must find food and shelter while avoiding the Japanese military. Struggling to survive, the marine and nun learn more about each other, themselves and faith. Heaven Knows, Mr. Allison is currently available to watch and stream, buy on demand at Amazon, Vudu, FandangoNow, iTunes, YouTube VOD online.